The Baltimore Orchard Project is proud to be one of the founders of the growing community-of-practice called “Community Orchard Network.” We are an informal, on-line network of groups and individuals engaged in or exploring community/urban orchards. The Alliance for Community Trees has graciously taken responsibility for organizing and administering the group and our monthly webinars. You too can join the network by writing to them at orchard@actrees.org. 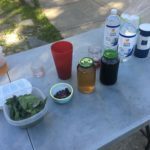 And you can also access our third webinar on urban foraging with Dr. Marla Emery, and one of our Stories from the Field with Rose Smiechowski of Hidden Harvest Pittsburgh here.